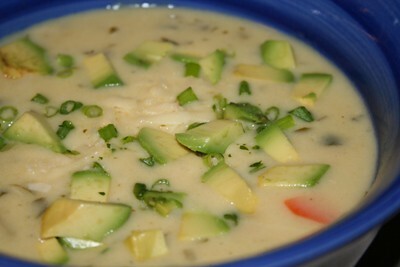 turkey poblano corn chowder, originally uploaded by All Things Mimi. What do you do with leftover turkey??? I'm figuring that out as I try to use up the gallon zip lock bag of turkey Dev's Mom sent us home with after Christmas. I don't really like turkey. But so far I've found ways to use it that have turned out really well. Take this soup, for example. It's actually based on a Paula Deen recipe for Chicken Poblano Chowder. I just subbed turkey for the chicken and added a few other ingredients. The soup is easy to make and it tastes even better the next day. I chopped up a small onion, 2 stalks of celery, 2 onions, 2 carrots and one medium sized poblano pepper. I sauteed them in olive oil in my dutch oven for about 10 minutes. I added a tablespoon or so of chicken gravy mix (the recipe called for chicken boullion, but I hate that stuff), then deglazed the pan with a little bit of white wine. Then came half a bunch of chopped fresh cilantro. I added 4 cups of chicken stock, 1 cup of white wine and 1 cup of water and let it cook for another ten minutes or so, for the veggies to get nice and tender. After that, I added about 2 cups of chopped leftover turkey and half a bag of frozen corn. I let the turkey and corn warm through, then in a skillet I melted a quarter stick of butter, then added 1/2 a cup of flour and made a roux. I cooked it for about 3 minutes, then added a ladle full of the cooking liquid. After it was incorporated, I dumped the contents of the skillet into the pot of soup. I let it come up to a bubble to thicken, then took it off the heat and added 1/2 cup of heavy cream. When I served it, I garnished with chopped avocado, chopped cilantro and shredded pepper jack cheese. This was really good. A lot of chopping, but the taste was outstanding.